With school back in action this week healthy lunches and snacks are important for active children. Just as adults need a balanced diet of all six nutrients (carbohydrates, fats, water, protein, vitamins and minerals), children and young adults are even more in need of these nutrients to help build healthy bones, increase brain functioning and boost their immune systems. Kids need a healthy school lunch to boost their energy and help them concentrate and learn in to the afternoon. Always include fresh fruit and vegetables. Vary the selection to keep it interesting. Add chopped up vegetable sticks as snacks or add salads to wraps and sandwiches. Substitute white bread for a variety of whole grain breads, rolls, pita bread and flatbreads. Use avocado as a spread instead of butter or margarine. Kids need a serve of protein at lunchtime. Ensure you include lean meat, egg, peanut butter, chickpeas or tuna. Protein is essential for growth and repair. Add a chilled bottle of water and limit juice. Muesli bars can commonly be found in kids lunch boxes. 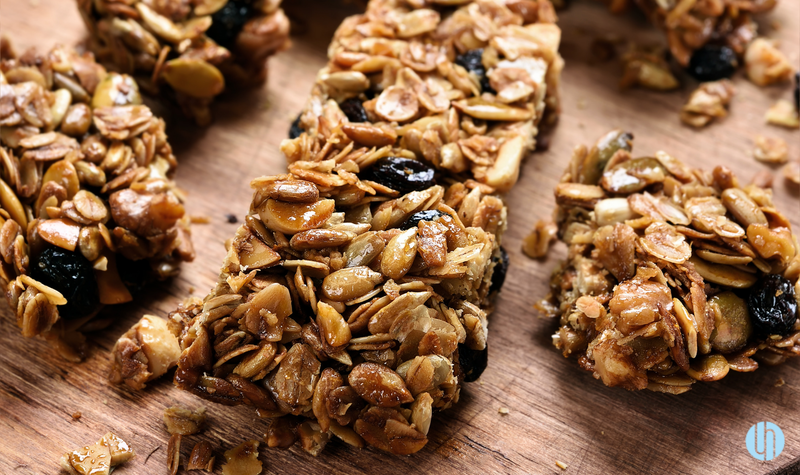 However muesli bars can contain many hidden sugars. Here is a healthy homemade muesli bars recipe. Combine seeds, coconut flakes and cherries together in a large bowl. Add melted coconut oil and 1⁄4 cup rice malt syrup and mix well. In a small saucepan, heat tahini, remaining rice malt syrup and salt until well combined. Add to above mixture and combine. Transfer into a lined rectangular bread tin and compact well using the palm of your hand. Apply force when you do this. Place in the fridge to set, before slicing into individual bars. ?